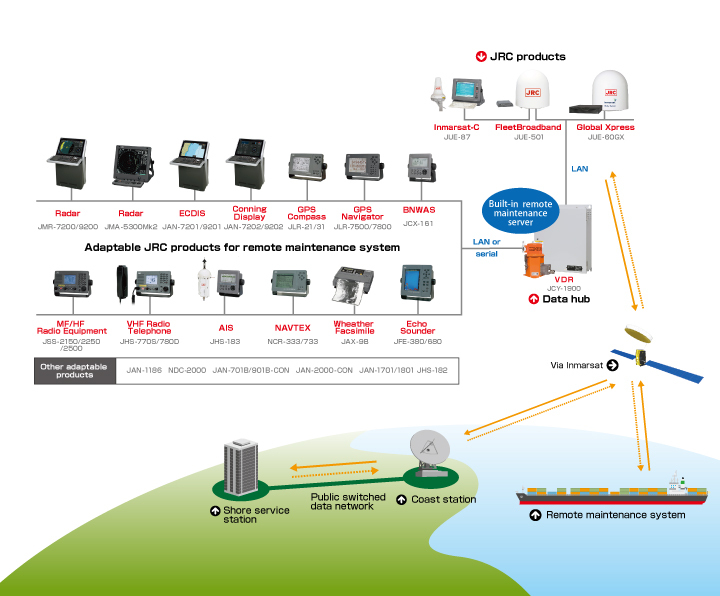 Remote Maintenance System (RMS) is a JRC’s original onboard equipment performance and functionality monitoring system using JRC’s JCY-1800 VDR as a server and Inmarsat satellite link*. JRC accredited technicians can remotely link to the equipment onboard the vessel to inspect, analyze, resolve or determine what actions are necessary at the vessels next port in order to quickly return the equipment to a full operational status. The ability to remotely diagnose the malfunction from land increases the completion rate of repairs at the first port and reduces the number of times the engineers have to board the ship. In addition, if parts do not need to be replaced, the engineers may complete the repair work without ever boarding the ship.